Warm the olive oil in a medium-sized saucepan over medium heat. Add the bay leaves, herbs, and garlic, and when they start to brown, add the barley. Stir until everything is coated and sizzly, then add four cups of water. Bring to a boil, reduce heat, and simmer for about 45 minutes. By the end, the water should be very much reduced, and should be thick and sort of creamy. Add 2 t of tamari and lots of freshly ground pepper. Cover and set aside until you’re good and ready for it! Roasted mushrooms made this way. 4 medium-sized potatoes. Cut into 1/4 inch chunks, tossed with olive oil and a little rosemary and roasted at 425 for about 1/2 an hour to forty minutes, till they’re brown and crispy. Give them a stir every once in a while. You can roast the mushrooms and potatoes at the same time – two trays side by side. The mushrooms will probably be done first, so you can just take them out and let them sit till you’re ready for them. 1/2 t red pepper flakes, or to taste. In a large frying pan melt 2 T butter. Add sage, rosemary, and thyme. When it starts to turn brown, give it about one more minute, and the pour in 1/3 cup white wine. Let it bubble away for a minute or two, then add the barley and all of its creamy broth. Stir. Add about 1 cup of water, and stir and cook for a minute or two, till it’s hot through and slightly thickened. Add the baby kale. Stir well. Taste for salt and pepperCOok for 5-7 minutes, till the kale is wilted, but not till it’s completely limp. Pile the mixture in a shallow bowl. Top with handfuls of potatoes, spoonfuls of mushrooms, and a scattering of pecans. If you like, add some bleu cheese, or any other cheese you like. 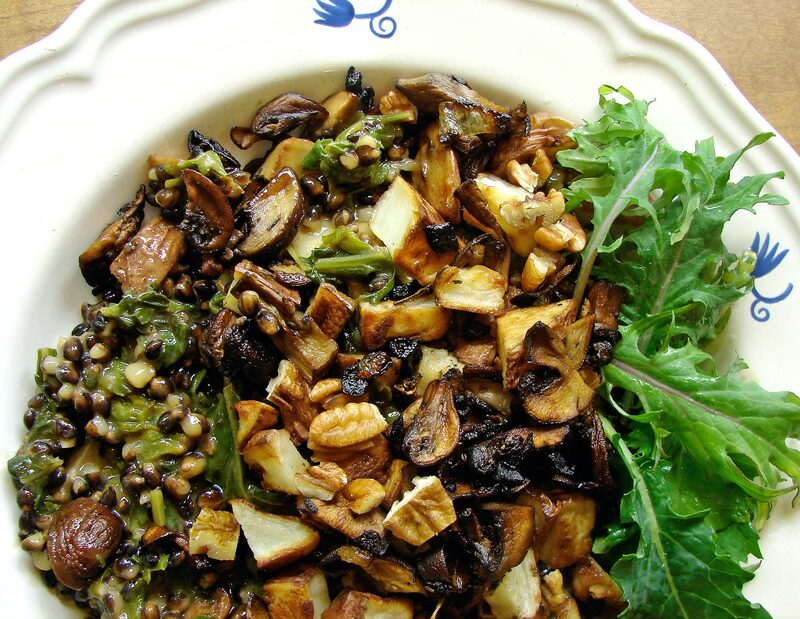 This entry was posted in mushrooms, potatoes, recipe, Uncategorized and tagged baby kale, black barley, risotto, roasted mushrooms, roasted potatoes, rosemary, sage by Claire. Bookmark the permalink.